Large storms and hurricanes do not occur often, but when they do, they cause much damage. The force of the wind can be devastating by itself, but combined with that of the waves and a storm surge, it can make living at the coast a risky affair. Knowing this risk and how it arises, could save lives. where Tropical cyclones (typhoons or hurricanes) occur in certain regions of the world. They are associated with warm seas. how Winds circulate from the warm tropics to the cooler temperate regions. Water vapour is capable of transferring massive amounts of energy to power tropical cyclones. consequences A tropical cyclone brings a fourfold threat: wind + waves + surge + rain. Its power is often underestimated. The under water world is affected mainly by waves. Read more about a category 5 tropical cyclone that wreaked havoc on the small island nation of Niue. Also read about how it affected the underwater environment, and read about its underwater survivors. Where do tropical cyclones occur? Tropical cyclones have their origins in the tropics but are not found in a band 4ºS to 4ºN around the equator (why not? see below). In Asia they are called typhoons (Gk tuphon= whirlwind, and Chinese tai fung= big wind) and in America hurricanes (Spanish huracan). The map shows hurricane paths and their areas. The northern hurricane zone from 4º to 35ºN is almost twice as wide as its corresponding southerly zone from 4º to 22ºS. New Zealand lies outside this zone but is regularly visited by hurricanes as they lose their energy and rain. Storms exceeding 65 knot (115 km/hr) winds, qualify as tropical cyclones, but their destructive power increases rapidly with wind speed. Tropical cyclones may last from a few hours to as long as two weeks, their average life being 6 days. This map shows hurricane tracks over New Zealand in the early part of the 20th century. Note that the North Island is more likely to be hit than the South Island. Also note that storms are more prevalent during certain decades and seasons. Hurricanes affecting New Zealand are not very strong, as judged by the Saffir-Simpson hurricane scale (see below). Only on two occasions did hurricanes of category one (970 mbar) reach NZ (bold print). As the world climate changes, more and heavier storms can be expected. Hurricanes do not occur in a narrow band around the equator because here the coriolis forces are zero (they work up and down). Thus winds cannot focus into an area of low pressure and spin around. Hurricanes do not occur further than 35 degrees from the equator because there the seas are too cold to power them. As hurricanes move from the warm waters nearest the equator outward to the cooler regions, coriolis forces increase gradually, forcing them to spin faster and tighter, thereby increasing their destructive power. Cyclones thus become most destructive shortly before the end of their paths. For an explanation about how coriolis forces or geostrophic forces work, read circulation/deflection. World map showing primary and secondary storm tracks and average atmospheric pressure. As winds transfer heat from the warm areas on the planet to the cooler ones, they swirl around while they are deflected by Coriolis forces, caused by the rotation of the Earth. In the Northern Hemisphere, moving objects are deflected to the right, resulting in low pressure areas (cyclones) cycling anticlockwise. In the Southern Hemisphere, this is the reverse. The extraordinary property of water, to require 400 heat calories in order to evaporate one gram (to heat one gram by one degree, requires one calorie), makes water vapour a powerful agent in the transfer of energy through the atmosphere. A tropical cyclone is born from a low pressure area by the interplay of rising and falling winds, warming and cooling air and the transfer of energy by water molecules. The result is a system of swirling winds that increase as they approach the eye, but inside the eye of the storm, it is calm. Powered by heat from evaporation, tropical cyclones can grow only above warm sea water. Once they pass overland or over colder water, they rapidly lose strength. In a stationary tropical cyclone, winds arriving from all directions, cause waves to radiate out in all directions. But once the system moves, the pattern changes as shown in this diagram for a Southern Hemisphere cyclone. The most powerful winds now arise from where the centre came from, sending large waves out ahead of the storm. The wind also pushes the water ahead of it, causing the water level to rise (storm surge). The size of this storm surge and its waves, depends largely on how the storm's centre has been moving, for the rotating winds around it are capable of cancelling each other's waves. Note that storm sized winds (but not of hurricane force) blowing for a long time from one direction, are capable of developing sea states equally destructive as hurricanes. A storm surge has two components: the pressure difference between high and low pressure areas and the water level swept up by winds. The diagram attempts to quantify the barometric effect. In the left half, the ocean is flat and the atmospheric pressure between a high and a low is represented as if the atmosphere extended further out in space. The atmosphere's pressure is almost equal to that of 10 m of water. It is expressed in bar, where one bar is the average atmospheric pressure on Earth. Due to the centrifugal force of a rotating Earth, the atmospheric pressure is less at the equator than at the poles. In New Zealand, it is about 1015 millibar. The effect of a high pressure area is that of pushing the sea level down. A hurricane of category one (970 mbar) is thus theoretically capable of causing a 45 cm storm surge (1015-970). In practice, winds are the overriding factor (see below). When a hurricane moves ever faster in one direction, very high waves can form underneath, arriving without warning. It is thought that this may have happened in the case of Cyclone Heta that destroyed much of the island state of Niue  but how does this work? The drawing shown here has three panels. The top panel shows the waves radiating out from a stationary cyclone and the next two panels of what happens when it 'chases' waves in one direction. With a stationary cyclone, the winds radiate out in all directions at equal strengths. It causes waves to build up toward the periphery of the cyclone and then to gradually diminish as they radiate out. As they move further away, their heights diminish but their wave lengths increase, causing them to run ever faster. Such waves can cover thousands of kilometres but they are always preceded by small waves before the bigger ones arrive. When a hurricane moves, its leading winds become stronger while its trailing winds become weaker. The stronger forward winds build up higher waves from the ones that would otherwise have escaped. However, as their wave lengths increase, they run away ever faster. Thus when a hurricane accelerates to keep up with them, these wave become monstrous without there being smaller waves to warn of their arrival. The important consequence of trapped waves is that the strength of a hurricane's waves is difficult to predict. For instance a category 4 hurricane can arrive with waves equal to a category 5 hurricane or larger. Cyclone Heta: Indepth article on this web site about Cyclone Heta and the damage it caused. What are a storm's consequences? Because both winds and waves increase rapidly with wind speed, scientists Saffir and Simpson have devised a hurricane scale in categories, each category being twice as destructive as the previous. The severity of a hurricane can be related to its barometric pressure, but a large degree of variation remains. Note that the maximum wind speed increases in a gradual fashion but the storm surge increases more rapidly. Maximum wave heights of a possible fully developed sea are not shown. In the table, the damage caused by hurricane winds is shown but not that of hurricane seas, which can inflict far more damage, although only to coastal settlements. Also the torrential rains from a weakening hurricane, can cause more damage than that caused by its winds. The threat of hurricanes to coastal dwellings does not come from wind alone. In this picture a typical situation is shown of many a coastal settlement, which are only 2m above spring high tide level. A storm may bring a one metre surge with 6 metre waves, allowing waves to nip over coastal walls and revetments, but a class three hurricane arriving with a 3m surge and 12m waves, will flood these settlements during high tide, causing major damage. The storm surge lifts the water high above the beach, allowing higher waves to ride much further inland than usual. Large storms always cause damage to beaches and dunes but these can repair themselves slowly after the event (See dunes & beaches). The high waves stir the sand deep down and up-root marine organisms living there. Both the sand and the organisms are transported towards the beach, causing wash-ups, sometimes of disastrous proportions. 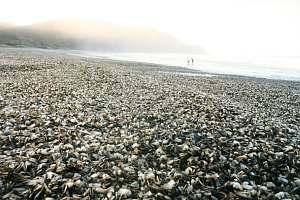 In March 1995, a large storm caused a massive washup of fan shells (Atrina) on Pakiri Beach near Te Arai Point. The beach was covered in a layer 500m long, 70m wide and 0.5m thick. These shells were all equally old, about 3 years, judged by their growth rings. They all disappeared 4 days later. On a normally sheltered cliff face near Leigh Harbour, kelp plants flourished until a rare south-easterly storm tore their canopies off. These rocks are normally bared by the grazing of sea urchins, but during a favourable calm period, the kelp managed to establish itself here. Beach erosion: the beach defends only against normal waves and tides. Large storms, however, attack the beach at a higher level and with larger waves. The beach sacrifices its foredune, which will later be rebuilt by the sea wind. Large storms transport new sand towards the beach, enabling the beach to grow in the calm period following the storm. Shell washups: the sandy bottom in front of beaches is ploughed up by the waves, causing sand and burrowing organisms to be transported towards the beach. The sand remains at the bottom of the beach but seashells and other organisms are washed up on the beach. Organisms burrowing fast or deep enough, are capable of staying secure. Occasional storms thus cause habitat zoning in the sandy bottom. Kelp washups: in calm conditions, kelp seedlings may settle in areas where they normally won't be able to survive. The first big storm rips them off the rock completely or tears their canopies. The hapless plants gather in masses in depressions of the shore (where they survive) or they are washed up on beaches (where they die). 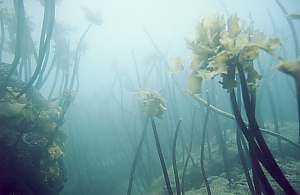 Particularly the stalked kelp (Ecklonia radiata) is susceptible. Turning stones: on the rocky shore in the intertidal range, rocks are often flipped, disturbing the mini habitats underneath. Sand blasting: close to the bottom, the waves, mixed with sand, do their sand blasting, scouring sponges and other sessile organisms. Where such organisms are partly suffocated by mud or plankton blooms, the sand blasting often works remedially, cleaning them. In areas of heavy sand blasting, only robust sponges such as the boring sponge (Cliona celata) can survive. Turbidity: In polluted areas, characterised by fine particles (mud) mixed in with the sand, seas become turbid while releasing nutrients (and sometimes poisonous hydrogen-sulfide gas H2S) from the muddy sand. The polluted water then kills sensitive marine organisms. Water stirring: large storms are able to stir the water so well that the thermocline disappears, allowing cold nutrient-rich bottom water to mix with the warm nutrient-depleted surface water, causing plankton blooms within a week after the storm. Mud torrents: tropical cyclones are also accompanied by torrential rains that cause massive erosion to the land, filling rivers with torrents of fast flowing mud. The mud ends up in the sea where it pollutes the water, suffocating water-breathing organisms and absorbing the sunlight, necessary for algae to grow. It was observed that cyclone Bola deposited a layer of mud, 15 cm deep on an exposed coast (the Goat Island marine reserve), taking seven years of average storms to clear it. Plankton blooms: as the mud releases its nutrients to the sea, and nutrients from deeper layers are stirred up to the surrface, dense plankton blooms can occur 3-10 days later, threatening all marine organisms. See the chapter on decay.